It wasn’t only the soldiers that help defeat Hitler. Hollywood also helped. Five of the greatest directors of the era, and some could say of all time, dropped everything to sign up to help win the war. These brave men were the legendary John Ford, William Wyler, John Huston, Frank Capra, and George Stevens. Adapted from Mark Harris’ best-selling book, “Five Came Back: A Story of Hollywood and the Second World War,” and directed by Laurent Bouzereau, the three-part docuseries tells the extraordinary story of how Hollywood changed World War II – and how World War II changed Hollywood, through the interwoven experiences of five filmmakers who interrupted their successful careers to serve their country, risk their lives and bring the truth back to the American people: John Ford, William Wyler, John Huston, Frank Capra, and George Stevens. 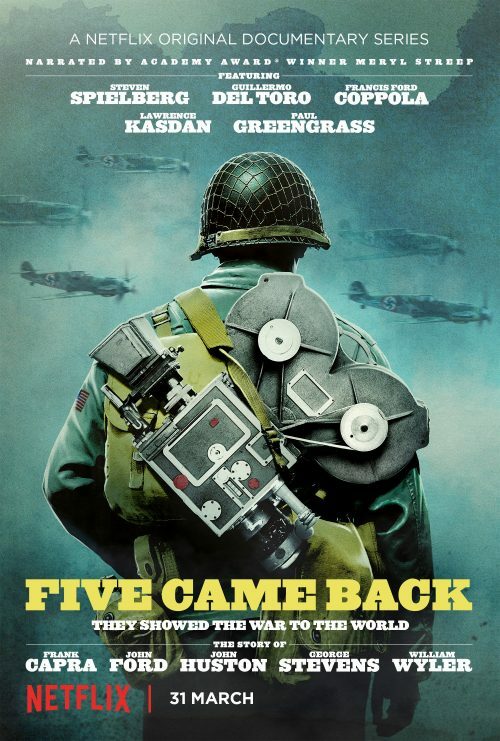 To guide viewers through the different personalities, interweaving chronologies and globe-trotting locales, the Five Came Back team turned to the voices of five modern cinematic masters: Steven Spielberg, Francis Ford Coppola, Guillermo Del Toro, Paul Greengrass and Lawrence Kasdan. Three-time Oscar-winner Meryl Streep provides the narration for Five Came Back.